Fire Extinguishers CO2, Dry Powder, Foam, Water and Wet Chemical. Fire Extinguishers Online - New Zealand. Suitable for small vehicles or kitchens. Used on Class B Fires - Flammable Liquids and Class E Fires - Electrical. Complete with a Wall Bracket. Rated for Class B and E fires, this clean, non-contaminating odorless gas is ideal as clean up is not required.. This reliable small compact unit is suitable for numerous applications including Chainsaw/Trail Bike/Forestry. To be used on Class A Fires - Wood, Paper and Plastics, Class B Fires - Flammable Liquids, Class C Fires - Flammable Gases and Class E Fires - Energised Electrical Equipment. Also available is the durable fully enclosed belt pouch for on hand use. Ideal for a small vehicle or kitchen. Used on Class A Fires - Wood, Paper and Plastics, Class B Fires - Flammable Liquids, Class C Fires - Flammable Gases and Class E Fires - Energised Electrical Equipment. Complete with a metal Vehicle Bracket. Steel cylinder powder coated red with large easy to use handles. Powder content is Mono-Ammonium Phosphate ABE type (85% MAP content). Ideal for racing vehicles. Used on Class A Fires - Wood, Paper and Plastics, Class B Fires - Flammable Liquids, Class C Fires - Flammable Gases and Class E Fires - Energised Electrical Equipment. Complete with a double strapped metal vehicle bracket. Steel cylinder powder coated red with large easy to use handles. Powder content is Mono-Ammonium Phosphate ABE type (85% MAP content). Ideal for a small business or medium sized vehicle. Used on Class A Fires - Wood, Paper and Plastics, Class B Fires - Flammable Liquids, Class C Fires - Flammable Gases and Class E Fires - Energised Electrical Equipment. Complete with a metal Vehicle Bracket. Ideal for a commercial or domestic location. Used on Class A Fires - Wood, Paper and Plastics, Class B Fires - Flammable Liquids, Class C Fires - Flammable Gases and Class E Fires - Energised Electrical Equipment. Complete with a metal Vehicle Bracket and wall bracket. Steel cylinder powder coated red with large easy to use handles. Ideal for industrial locations and fuel stations. Used on Class A Fires - Wood, Paper and Textiles, Class B Fires - Flammable Liquids, Class C Fires - Flammable Gases and Class E Fires - Energised Electrical Equipment. Complete with a Wall Bracket. Suited for commercial and industrial buildings. Used on Class A Fires - Wood, Paper and Plastics, Class B Fires - Flammable Liquids, Class C Fires - Flammable Gases and Class E Fires - Energised Electrical Equipment. Complete with a Wall Bracket. Fluorine Free Foam, also known as F3 Foam is ideal for racing car situations and is effective on petrol, methanol and volatile liquids forming a smothering seal over the surface preventing re-ignition. Complete with wall bracket. Heavy duty vehicle bracket, suitable for our 2.5kg Dry Powder Extinguisher various fixing points within bracket for securing to vehicle or wall. Heavy duty vehicle bracket, suitable for our 4.5kg Dry Powder Extinguisher various fixing points within bracket for securing to vehicle or wall. Heavy duty vehicle bracket, suitable for our 9 Litre Foam Extinguisher various fixing points within bracket for securing to vehicle or wall. Heavy duty vehicle bracket, suitable for our 9kg Dry Powder Extinguisher various fixing points within bracket for securing to vehicle or wall. 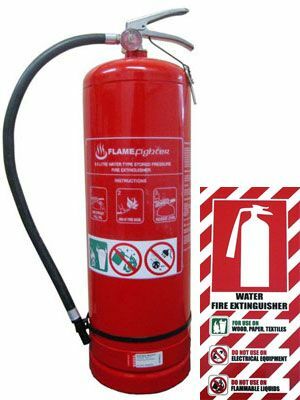 Water extinguishers are suitable for Class A fires involving paper, wood, straw, textiles etc. The 9 litre water extinguisher is easy to use and less costly to maintain and service. Generally recommended for offices, convenience stores, retail shops etc. Ideal for areas where a large fat fire may be encountered. Used on Class F Fires - Cooking Oils and Fats. The wet chemical is a hand portable fire extinguisher specified for restaurants and kitchens.